(L-R) Tony Palermo, Jacoby Shaddix, Jerry Horton and Tobin Esperance of Papa Roach visit SiriusXM Studios on May 17, 2017 in New York City. 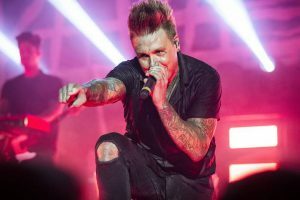 Tony Palermo of the Papa Roach performs at Mercury Ballroom on April 24, 2018 in Louisville, Kent. TP: That’s because we got all the program directors drunk. [Laughs] Nah, we’d invite them backstage after all the shows. They were all hyped on the shows so we’d show them some new music. So what can Canadian fans expect in the near future? JS: Yes, more lights. We’re going to blind them. [Laughs] But a grade-A f**king rock show, it’s not rocket science. We’re actually in the process of putting together our Canadian run too, so that’s definitely in the cards. It’s all being built right now. JS: Thank God I was insane before social media. [Laughs] But as far as that goes, being a father really changed how I present myself. Besides that, I never intended to assume the responsibility of somebody’s role model, it’s a tricky dynamic.